In a show of strength, West Bengal Chief Minister Mamata Banerjee, backed by the Janata Dal-United, the Samajwadi Party, the Nationalist Congress Party and the Aam Aadmi Party, on Wednesday held a demonstration against demonetisation in New Delhi and ramped up attack on Prime Minister Narendra Modi, alleging the country was not safe in his hands. Addressing the gathering at Jantar Mantar, Banerjee alleged that abolition of high-value currency notes had heaped pain on people and snatched away democratic rights of almost every section of the society including farmers, youth, women, labourers and traders, besides halting the country's economic growth. Accusing the Bharatiya Janata Party-led dispensation of "looting" the common man, she wondered why those having Swiss bank accounts were "not touched at all", and warned that people will teach a "good lesson" to the ruling party in the upcoming assembly polls for implementing a "black law". "I can challenge that no one will vote for BJP. If I were you (PM), I would have apologised to the public. Why you are so egoistic? 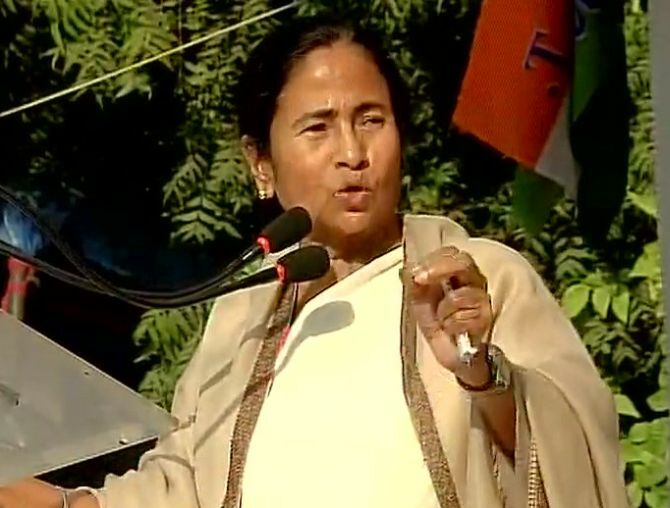 You have branded everyone in the country a black marketeer and have yourself turned into a saint ," Banerjee said. In his address, JD-U leader Sharad Yadav questioned the legality of the demonetisation exercise and challenged the prime minister to explain to the Parliament how the decision will benefit the country. "Under which law have you enforced this measure? You are stopping a person from withdrawing his hard-earned money which is his fundamental right. Demonetisation has destroyed the business of small traders. Come to Parliament and explain the logic as to how it will curb black money," Yadav said. The presence of Yadav at the protest assumes significance as his party had supported demonetisation. The street protest was also addressed by SP's Dharmendra Yadav, AAP's Raghav Chadha and NCP's Majid Memon. The West Bengal Chief Minister also lashed out at a group of people who were shouting pro-Modi slogans, alleging that they were sent to disrupt her public meeting and wondered what the police and administration were doing. Referring to Tuesday's bypoll results, the Trinamool Congress chief said BJP's victory margins have come down significantly in Madhya Pradesh and that Modi has left the country in the lurch (Modiji ne desh ka barah baja diya)." Banerjee said that she will continue her fight till woes of the people are not addressed, adding she will also support a country-wide protest called by the Opposition parties on November 28 against demonetisation. Last week, Banerjee had addressed a rally against demonetisation along with Delhi Chief Minister Arvind Kejriwal.